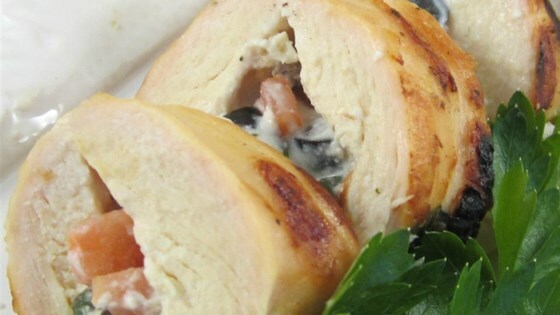 "A delicious creamy blend of Greek flavors rolled up in chicken. I just threw this together last night and it turned out amazing. I made 3 chicken breasts and still have a huge bowl of filling. I am going to try to make several other dishes with it. Tonight - stuffed burgers. Tomorrow - filling on rye bread topped with shrimp or cucumber as an appetizer. It might also be delicious with lamb, fish, or in a pita wrap with lettuce. Experiment with this filling because it is delicious all on its own. Serve with Greek salad or side dish of choice." Cut each chicken breast from one side through the middle horizontally to within one-half inch of the other side. Open the two sides and spread them out like an open book. Mix cream cheese, feta cheese, tomato, olives, onion, and spinach together in a large bowl. Spoon cheese mixture onto 1 side of each opened chicken breast. Fold each chicken breast closed and place on a piece of aluminum foil. Cook the chicken breasts on the preheated grill until no longer pink in the center and the juices run clear, 15 to 20 minutes. An instant-read thermometer inserted into the center should read at least 165 degrees F (74 degrees C). The spinach and onion are best chopped in a food processor. I really liked this! I also baked in the oven. Very rich tasting and quite filling. This is a pretty dish with lovely flavor. I rolled and tied the breasts before grilling which worked out very well. Made this yesterday,followed recipe pretty much exactly,except baked in oven,excellent.served with rice. Great recipe! The recipe made more stuffing for the chicken than we needed, but we used the extra for a dip for chips and our company loved it! Great recipe, loved the cream cheese mix! I think it would make a great dip as we'll.